The Mini Princess Cut Cubic Zirconia Channel Set Hoop Earrings feature channel set princess cut squares set halfway around each earring. The hoop earrings measure approximately 12mm in diameter and approximately 3mm in width. 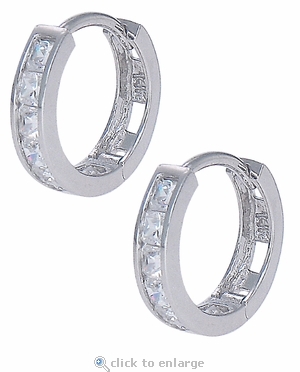 The earrings secure with a snap-in type closure and include approximately 1.5 carats in total carat weight. These earrings make a wonderful birthday gift or graduation gift or for any special occasion. Our Russian formula cubic zirconia that is hand cut and hand polished to exact diamond specifications is coupled with a diamond quality mounting for the best possible finished product. The hoop earrings are perfect for everyday wear and straight into the night with its delicate mounting and sparkling princess cut cubic zirconia stones. 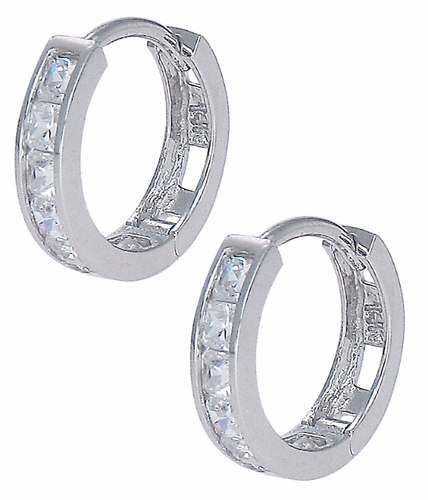 These clearance hoop earrings are available in 14k white gold.